Natalia Sukharevich was born in Moscow. She started her piano education as a concert pianist at the Music College of Moscow Tchaikovsky Conservatory (class of famous teacher Y. Batuev). In 1999 she was enrolled in Moscow Tchaikovsky Conservatory in the class of Peoples Artist of Russia, professor A. Nasedkin, the outstanding pianist and teacher. In 2004 she graduated from the conservatory with Diploma of Honours. From 2004 to 2007 she continued her studies at a post-graduate course in the Moscow Conservatory with the same teacher. From 2006 to 2008 she had a “Virtuosismo course” in Accademia internazionale di Musica in Roma and from 2010 to 2015 high course “Corso di perfezionamento” in Accademia Musicale Santa Cecilia di Bergamo with the famous pianist and teacher K. Bogino. She became a laureate of the International Piano competitions : “Citta di Minerbio” (Italy, 2002), “Marco Fortini Prize” (Bologna, 2005), “Premio Franco Alfano” (Genova, 2006), “Unda Maris” (Palermo, 2007), “Premio Vanna Spadafora” (Rome, 2008), “Huesca Piano competition” (Spain,2011) etc. 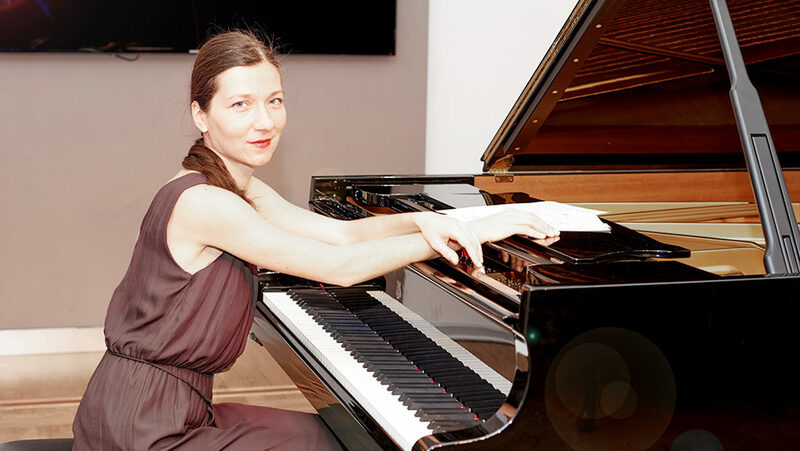 Ms. Sukharevich performs concerts in Russia, Italy, Israel, Sweden, France, and Estonia at various renowned concert venues with solo performances and with orchestras. Natalia also has been a participant and of some important musical festivals, such as The Chamber Music Festival in Sandviken (Sweden), Eilat International Chamber Music Festival (Israel), “Città di Lucca” Chamber Music Festival (Italy), LeXGiornata di Brescia (Italy), Trelleborg International Piano Festival (Sweden), “Festival Erik Satie” (France) etc. Her diverse repertoire embraces a wide range of styles and trends, from barocco to contemporary music. She has numerous different solo programs, many concertos for the piano and orchestra and lots of chamber music as well. She taught as an assistant of Professor Aleksey Nasedkin at the Moscow State College of Musical Performance named after Chopin. Ms. Sukharevich gives masterclasses in Russia and Estonia.